How did I get to be almost 40 years old and not know how to clean a refrigerator? At least I have been telling myself that my whole life. I say it to myself and others often, really driving home the fact that I don’t organize things or life well. But it turns out I do like the idea of organization. And sometimes I can even do it. And sometimes I even enjoy doing it. Sometimes things just get so bad it’s either “throw the messy thing away” or “clean the messy thing”. 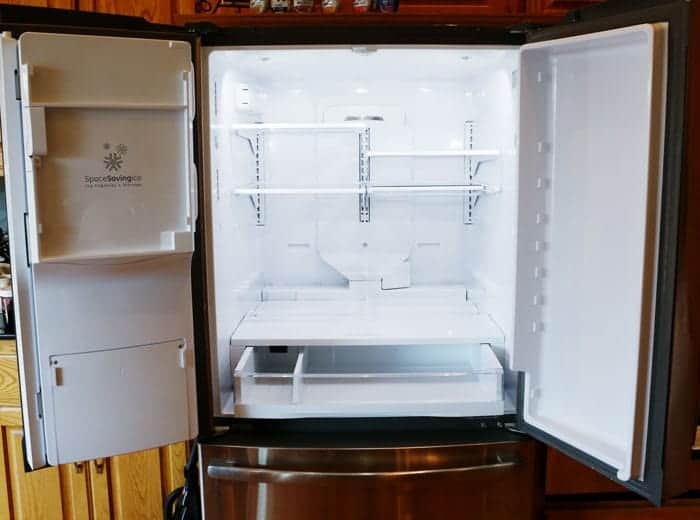 I can’t throw my fridge away, so I decided to give it a good cleaning. Seriously. Those are CRACKERS on the shelf. And there is so much stuff shoved into there I have no idea what food we actually have. Is it edible? Expired? So I turned to google and searched “how to clean a fridge”. If I was going to get in there I was going to do it right! 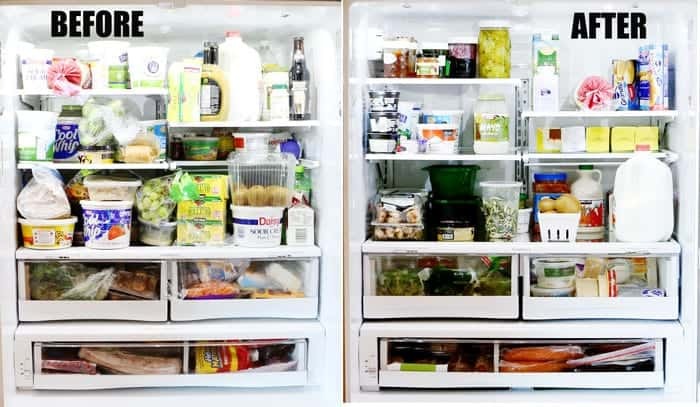 I looked at articles and pictures and kept seeing all these weird baskets in the fridge and storage organizers and lazy-susans and it was all pretty confusing. I mean, why would I need a lazy susan for my salad dressings when there was a perfectly good space in the door? And why would I need a basket for fresh veggies when I had a drawer designed and designated for them? 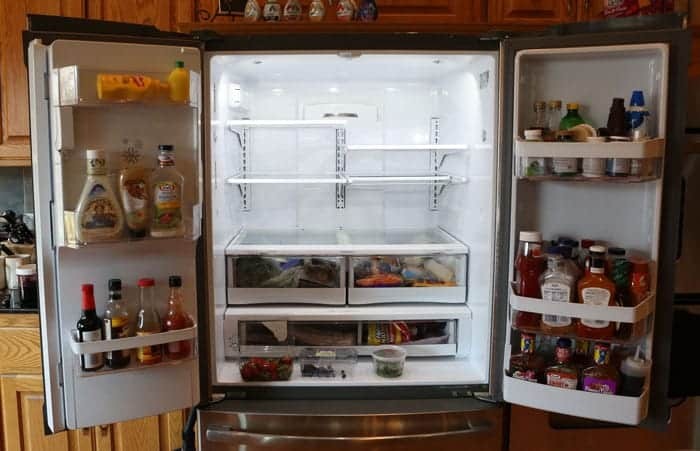 So, instead of making a trip to Bed, Bath & Beyond I decided that a good cleaning was all my fridge needed. I started taking things out. Like, everything. I piled food up on the counter and when that was full the other counter and when that was full the table. 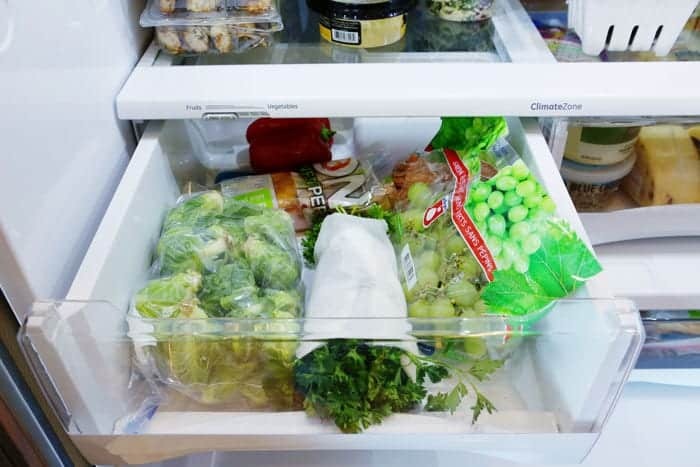 I wanted to make sure that I moved quickly to preserve the freshness of everything so once I started taking things out I didn’t stop. When I had removed all the food I looked at the shelves and drawers and realized there was a LOT of dirt behind things. So I took it a step further and removed all the drawers and shelves too! 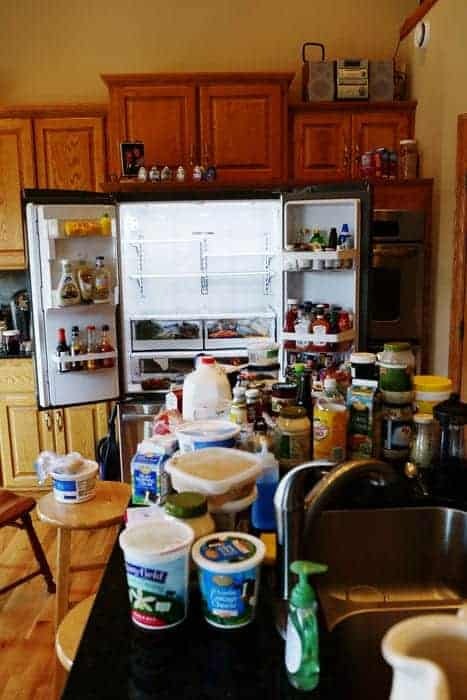 Removing the shelves and drawers meant I could close the fridge, give them a hot soapy bath and get them back into the fridge. This ended up being faster than standing in front of an open fridge scrubbing cold shelves. What was the plan now? 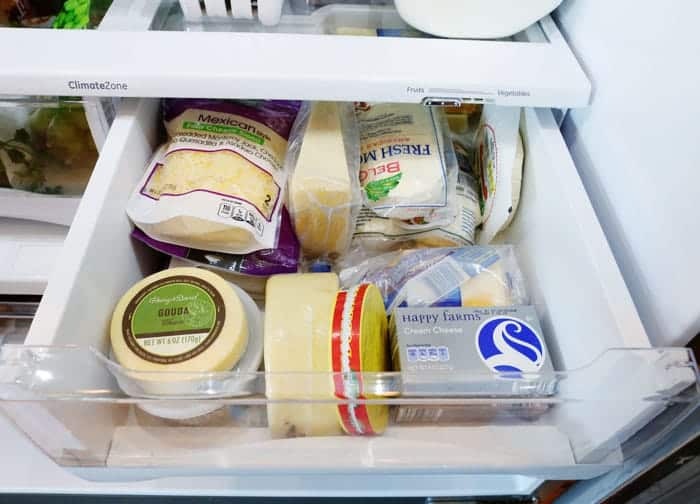 Once I had the shelves, drawers, and door shelves back in the fridge I wanted to make sure that every food item was safe to eat. This decreased the contents of the fridge by half! This is the AFTER picture. Keeping milk on a lower shelf and out of the door. I have read studies that say milk stays fresher longer when stored on a shelf in the fridge. There needed to be room for leftovers. Leftovers (and having them easily accessible) are simply a fact of life in a family of 7. I need to be able to see what I have. As you can barely see in the photo below, I had three BIG containers of mayo. We don’t even eat mayo that often, so this is not only a waste of food but of space. 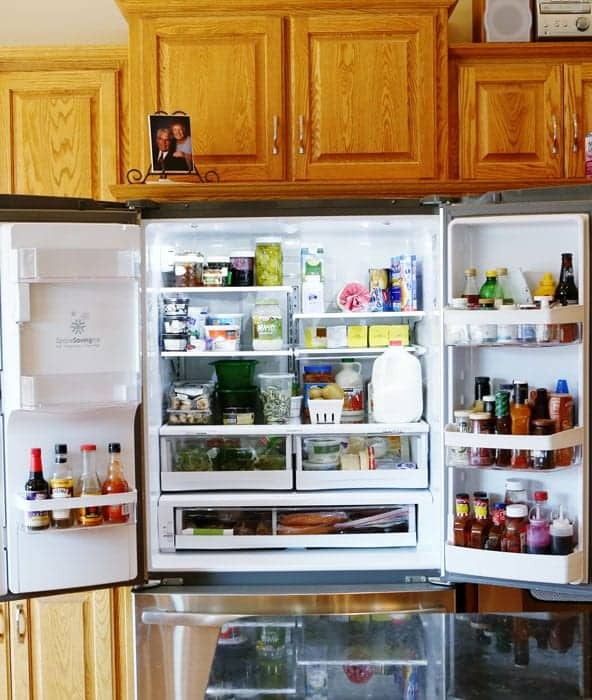 Knowing how much I have of certain products at a quick glance saves time, money, and space. My butter needs its own shelf! When you make 20 pounds of buttercream every month you are going to go through a lot of butter. Not to mention cooking and regular daily use! Why I have so many containers of crescent rolls, I have no idea. I also discovered that I was storing my herbs wrong… that things like parsley and cilantro should get a quick bath when I bring them home and then be wrapped in a damp paper towel. (or clean dish towel) Brussel sprouts were cleaning and placed in a sealable plastic bag. And my peppers should be stored in the fridge instead of on the counter, which was news to me! 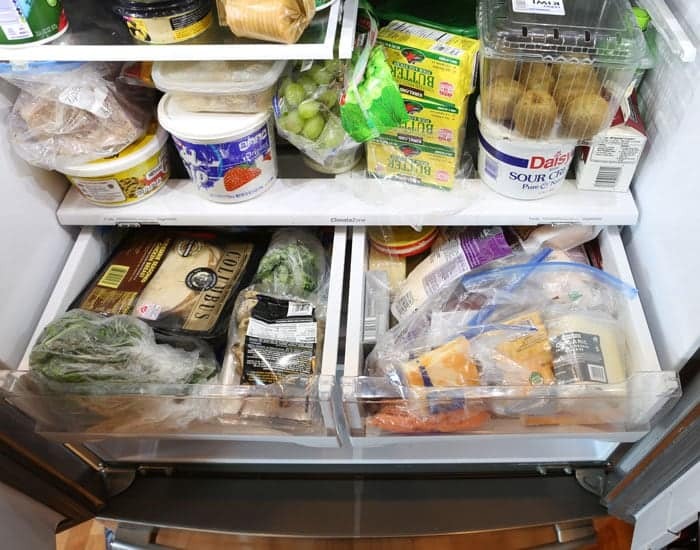 It’s wise to have an organized fridge. 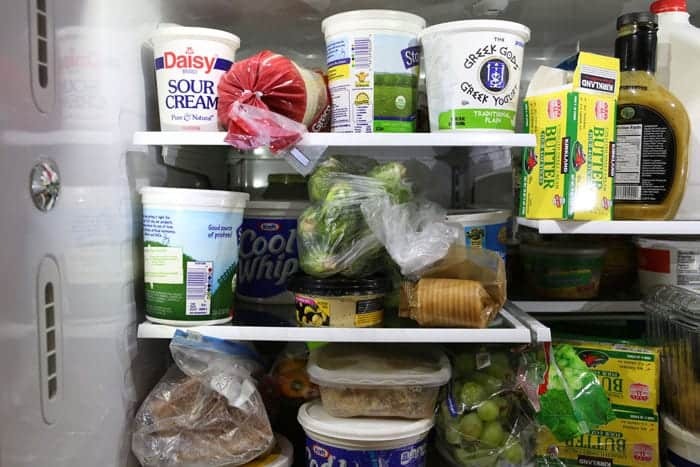 It’s good to go through the contents of the refrigerator and toss what is expired. 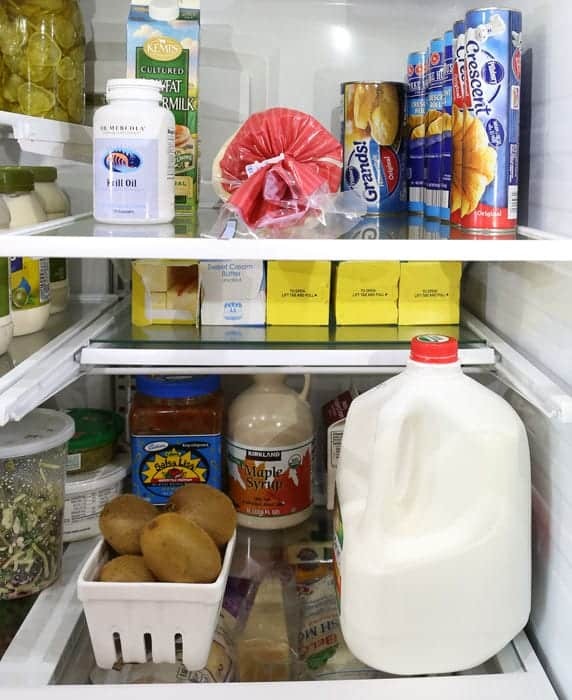 No fancy “fridge organization” gadgets are needed! In a space that is constantly changing to adapt to its inhabitants, shelf organizers and lazy susans ended up be more trouble than they were worth.